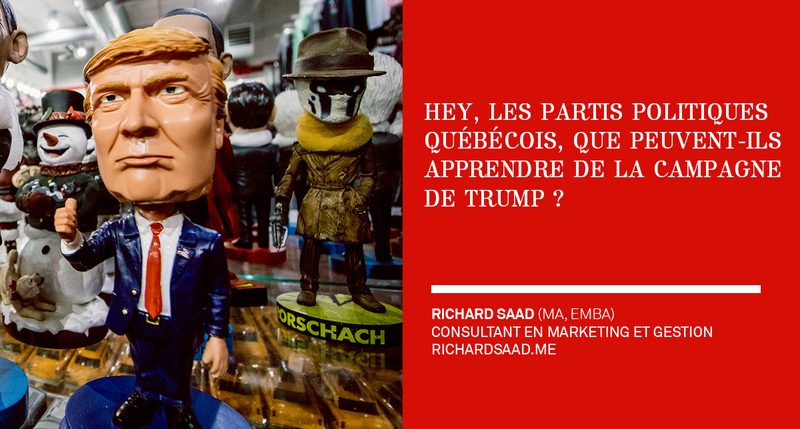 Richard Saad (MA, EMBA) » Hey Quebecois Candidates!? It is time to Trump your campaign like a pro. Trump: the man we love to hate. I remember so vividly the moment when CNN announced the final results of the U.S. election. I was surprised and confused as to how it was possible. I started thinking about what I had missed. I was so sure that the Democrats would win that I bet $1,000 on Clinton’s win. Fortunately, my friend backed out at the last minute. However, from a marketing perspective, Trump’s campaign was as efficient as it was controversial. + What can Quebecois political parties learn from the Trump campaign? How did Donald Trump win this election despite the overwhelming predictions of all major polls? What was his marketing strategy? He won by merely applying basic concepts of marketing. He was successful in delivering the right message to the right audience at the right time. Trump worked the three variables seamlessly and successfully. 2-Trump turns the elitist message into a populist one. Instead of saying: “I understand your anger,” he said: “I am angry too.” Trump positioned himself as a protector of a tribe as opposed to a political leader for all Americans. Today’s brands are those who live the pain and the joy of their community; their feelings and expressions are genuine. For instance, Tom’s shoes and other impactful brands are actively supporting their community by donating a certain percentage on each sale. Brands must speak their mind, stay firm in their beliefs, engage in global issues, be genuine and make mistakes as any human being would. 1- As a brand, there is not a candidate that can please everyone. It’s essential to identify the audience you want to target. Donald Trump knew very well his audience’s behaviour, frustration, and motivations. He focused on his target segment and ignored the rest. He did not care about winning the heart of minorities and was not women’s biggest fan. Trump did what marketing teaches: focus on your target segment and ignore the rest. By sticking and fighting along his tribe, he consolidated his base of supporters who ultimately led him to the presidency. 2- Donald Trump’s success is based on his capacity to turn his audience into an efficient army of influencers. In my opinion, it’s better to have two hard-die fans than ten supporters. These hard-die fans can influence and propagate the message way more efficiently than any advertising campaign. It’s no secret that we are in an era where we are bombarded by all types of promotion which are diluting a brand’s credibility. When it comes to recommendations, we turn to friends, family and trustees. We are all influenced by the people we love and trust. Donald Trump has a solid community behind him and a large number of social media followers who cherish his beliefs and values. These followers are more than supporters: they are his brand ambassadors. Donald Trump won the white working class women’s vote due to the influence of their spouses who are Donald Trump’s core-base. It is not new that social media play a significant role in elections, but what I noticed in 2018 is the importance of earned media compared to paid media. Earned media are the number of shares, reviews, shares and reposts of Donald Trump stories. Paid media are mostly paid per click and paid advertisement. In the case of Donald Trump, the multiple retweets and reshares of his messages multiplied his reach beyond any paid media. •	Government policy, foreign trade, tax, labor law, trade restrictions and reducing corruption. •	Economic growth, exchange rates, interest rates, inflation rates, disposable income, and unemployment. •	Population growth rate, safety, health system, social attitude, culture. •	Climate and environmental policy. •	Discrimination, consumer protection, employment, patent, copyright, and health law. Two specific topics become Trump’s main focus which are Foreign Trade and Safety. He was neither interested in climate policy nor in protecting the environment. It is a complete shift from his predecessors. As in marketing, a product cannot promise everything to everyone: there are trade-offs to consider. The brand’s promise has to appeal to its target audience, and this is what Donald Trump did. 1 – An election campaign is not very different than a branding campaign. The candidate wants attention, engagement, and conversion. Parties have to segment their audience and focus on their targets while ignoring all other segments. Like a Unique Selling Proposition (USP), the message must be loud and emotionally charged. The candidate’s style and personality must reflect the message. In other words, the message and its messenger should merge and become the brand of the party. 2 – Winning the hearts and minds of the audience is the key to success. Hence, it is vital to know your audience’s motivation, frustrations, behaviours, etc. Candidates must emerge for the community they seek to serve. Those from the community have insight that no one else has. Being an insider helps address the problems that matter the most for the community. 3- The same message can perform very differently based on the current context. Therefore, assessing the context and then selecting two to three vital topics is essential. As in marketing, you position yourself based on the competition, and then you put all the work and the energy on the value you are proposing. Hence, the value proposition needs to be in conjunction with the current reality.